Dr. Dean Hugh Stephens is board certified in Rheumatology and Internal Medicine. He attended medical school at the Medical College of Georgia in Augusta, GA. His rheumatology fellowship and internal medicine training were completed at the University of Vermont. After fellowship he joined the faculty at UVM and worked as an Academic Rheumatologist. His research interest was in Dermatomyositis. He and his wife decided to leave Vermont and move back to Savannah, their hometown, after their first child was born. He and his wife now live in Southside Savannah with their two children. Dr. Stephens has been practicing Rheumatology in the Savannah area for 6 years. He serves on the clinical staff at Memorial University Medical Center. He has an appointment with the Mercer University School of Medicine as an Associate Clinical Professor and enjoys teaching medical residents. 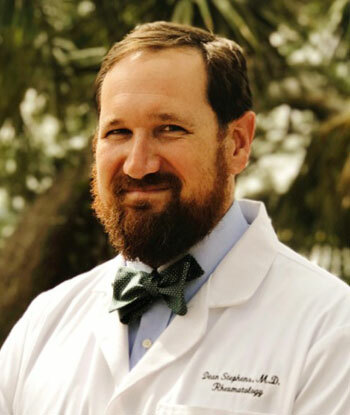 He is excited to be working together with Articularis healthcare to help provide rheumatology care to the people of South Georgia, the Savannah area and the South Carolina Low Country.